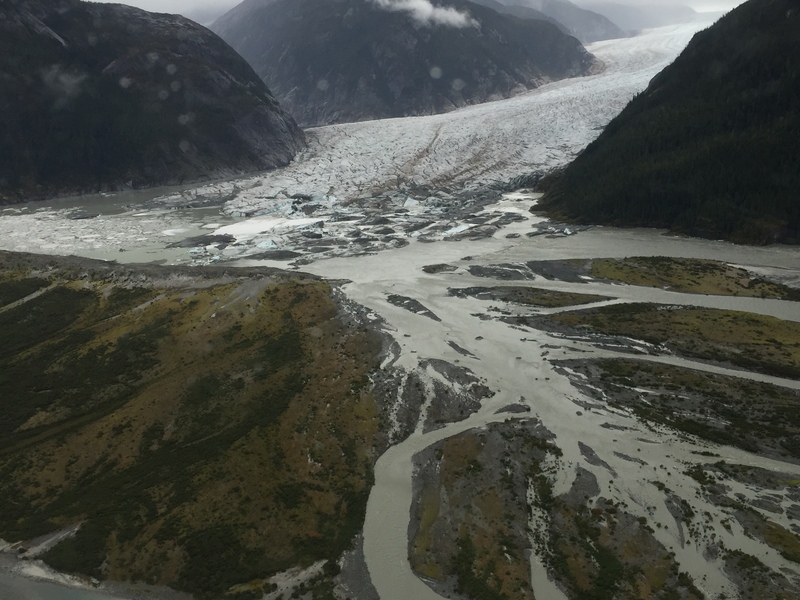 An explosive outburst of flooding from the Baird Glacier near Petersburg last week caused turquoise green water to spread into nearby Frederick Sound and the Wrangell Narrows. It’s something that residents hadn’t seen before. When 83-year-old Paul Bowen was out hand trolling near Petersburg and noticed green water he knew something was happening. He knew the color was from fine particulates mixed with fresh glacier water that were releasing into the sea. Bowen has been paying attention to the Baird Glacier for decades. He was the high school geology teacher for about 35 years and regularly took students by boat to study the glacier. He’s seen outburst flooding before also known as jokulhaup. The last time was 1991 but it wasn’t this extreme. It went pretty much unnoticed unless you were close to the glacier where the water was more of grayish. “It’s very unusual to have this much out wash of color,” Bowen said. Bowen wasn’t the only one who saw something odd while out boating. Brad Hunter started to notice small icebergs in Frederick Sound north of Petersburg. They were a little too far North to be from nearby Leconte Glacier. Hunter works for the U.S. Forest Service and he and another worker were on their way to Thomas Bay to check on a trail there. He saw more icebergs than usual and silty water so they decided to check out Baird Glacier. Hunter knew about outburst flooding but he had never experienced it himself. “It was very cool,” Hunter said. Hunter had been to the Thomas Bay area many times but had never seen it like this. It was near low tide but instead dry flat ground he was surrounded by water. He was about a mile away from the glacier. Hunter reported the incident to several others at the Forest Service and the next day flew over the glacier with a couple of other scientists. They noticed that the water was calming but there were icebergs everywhere. More had calved off into the lake in front of the glacier. As things unfold the Forest Service is telling local boaters to look out for ice in unusual places. And perhaps advice from the past is also relevant. It’s what Petersburg’s current geology teacher Victor Trautman heard from Paul Bowen 20 years ago. And flood the whole area it did. Greenish turquoise water could be seen in the Petersburg area for days. And to an old timer like Paul Bowen, it’s something worth noting. They still have many questions that they’d like answered such as what does this mean for the life of the glacier? Will the flood affect unique vegetation that’s being studied there? And how might all that fresh green water affect area fish? More flights had been scheduled over the glacier to try to solve at least some of them. Previous articleOctober 2015 Television Highlights: Arctic Entries is Back!